1) Body Type: There are a lot of body options to choose from but it basically boils down to two categories - Fully Custom and Standard Body. 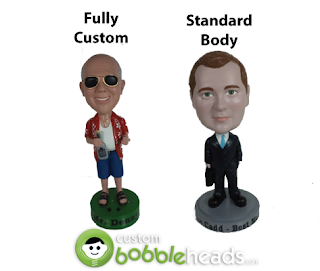 As the name implies, “Fully Custom” is essentially a blank bobblehead you can design from head-to-toe. “Standard Body” bobbleheads, on the other hand, are based on a certain model. This could be a baseball player, businessman, nurse, male, female, etc. Again, you’ll be able to select from hundreds of available options. Notice the accessories and props included in this model. This is an example of a pretty elaborate custom base, lettering included. 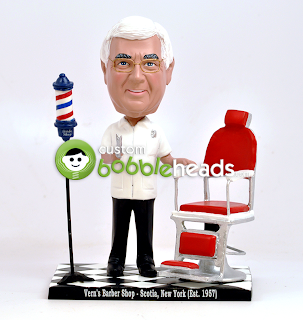 5) Material: Quality custom bobbleheads are made from a durable polyresin material. Due to its highly customizable characteristics, polyresin allows for the finished product to be highly detailed in all aspects of the design. 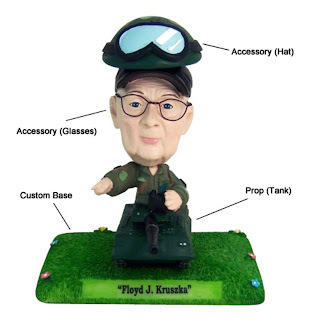 Polyresin is the industry-standard when it comes to quality bobbleheads but some companies opt for polymer clay because it shortens the process time. Unfortunately for consumers, clay is a cheaper and much more fragile substitute. 6) Proofing: During this part of the process, customers can actually approve, deny, and request changes to their custom bobblehead(s). Some companies charge extra for proofing while others include it in the initial bobblehead price. Not all proofing is equal either. In other words, one company might offer unlimited proofing while another allows only one proof per stage. If you want your custom bobblehead as close to perfect as possible, unlimited proofing is the key. You'll also want a proofing process that is interactive and centered on user experience.